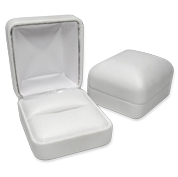 Shop our white leatherette gift boxes section and get a deluxe look for your jewelry collections! Discover high-quality pieces, perfect for packaging rings, earrings, bracelets, necklaces or pendants. All items are available at wholesale discount prices that won't break the bank!